Why prasugrel is heavily indebted to aspirin for it’s glory ? . . . The curious case of human platelet business ! Platelets are the major culprits in initiating arterial thrombus.Platelet inhibition is the key modality to treat /prevent acute and chronic coronary syndromes. It is an approved indication for primary and secondary prevention of CAD. Anti platelet agents are the biggest drug market among the cardiac drugs. It is a billion dollar medical game played with two million human platelets ! Aspirin is the best anti-platelet agent known .It is not only most effective but also available at a fraction of the cost other drugs. Unfortunately it is a generic and not a patented one .Being cheap , good safety profile is the biggest disadvantage of aspirin ! So , consistent efforts were made to make this drug appear weaker. Hence came many new anti-platelet agents . Clopidogrel is equally effective like aspirin in ACS. Aspirin alone is dangerous in ACS. Aspirin + Clopidogrel provides the best anti-platelet action. Aspirin + Clopidogrel combination is still dangerous . Never use clopidogrel alone in DES patient. Mono platelet inhibition is a crime ! Risk of sudden death continues to be significant in spite of dual antiplatelet agents in many with DES. For prasugrel to be really useful it should always be prescribed with aspirin. Prasugrel alone can be dangerous in stented patients. What do you infer ? To a discerned reader all of the above statements may appear wrong ! *Finally , it looks to me both clopidogrel and prasugrel ride a fake ride on the shoulders of trusted war horse called Aspirin . There is a strong basis for this suspicion as none of the researchers are ready to do a one to one direct comparison between aspirin and prasugrel or clopidogrel ! Eccentric plaques : Another grey area in interventional cardiology ! Reporting a coronary angiogram may look like child’s play for most cardiologists. Many do it in less than a minute. (It goes something like this 90 % LAD , 30 % ostial OM1, 50 % mid RCA etc etc ) The famous and meticulous classification of Ellis and Ambrose proposed two decades ago appear largely redundant. In this review we shall briefly debate an eccentric plaque or lesion . Pathologically an eccentric lesion will have a disease free arc within an atherosclerotic lesion.If we apply this criteria most of the plaques appear to be eccentric. In simple terms eccentricity is said to be present when the plaque volume is three times more on one side when compared to opposite side . The incidence of eccentric lesion is largely under estimated. It can be up to 40 % of all lesions. It has histological as well as hemodynamic significance. How to measure eccentricity index ? In the above figure : The eccentricity index is measured as the ratio of the maximum to minimum plaque plus media thicknesses. In the eccentric lesion the maximum wall thickness measures 2.6 mm, minimum wall thickness measures 0.2 mm, and eccentricity index is calculated to be 5.2. In the concentric lesion the maximum wall thickness measures 2.2 mm, minimum wall thickness measures 1.6 mm, and eccentricity index is calculated to be 1.4. What are the associations of eccentric plaque ? Calcification and hard plaques are more common in eccentrically placed plaques.The most vulnerable point for plaque rupture or disruption is the shoulder region between normal and plaque segment. An arc of normal plaque circumference predispose to acute recoil and spasm.this is logical as the normal arc will have a fully functional medial smooth muscle which are prone for spasm. Does stenting reverse the eccentricity of plaque ? It may not . The drag effect of major plaque mass may either result in plaque prolapse or asymmetric stent approximation or even stent crushing effect. How does the the stents elute in an eccentric lesion ? Stents are not intelligent enough to differentiate the plaque surface and normal surface. We also know these drugs are toxic to normal endothelium and hence are not welcome in the normal arcs of an eccentric lesion. Since the drug secretion is uniform throughout the circumference it makes the DES a perfect misfit in eccentric lesions As we realise most of the lesions are pathologically eccentric one can guess the long term consequences . The more we think we know . . . the less is understood . Low flow -Low gradient Aortic stenosis : Clarity replaced with confusion ! New concepts are created to clear confusion and bring clarity. We know all along low gradient AS is a hall mark of severe LV dysfunction. Now we suddenly invented normally contracting LV can also cause low gradient due to low flow when the aortic valve orifice becomes very critically narrow . How can it occur ? . . . few suspect it to be semantics ! The terminology that is often used in recent times when describing severe aortic stenosis.This is called Low gradient severe AS with preserved LV function . But logic would say blood flow is required to produce gradient .If it falls extremely low the gradient is likely to fall. If that is the case every severe AS patient will experience low flow at least in few beats . Is this the reason why we find it very difficult to reproduce the exact gradient ? Low flow ,Low gradient aortic stenosis is not a new entity .It is the way we look at the data. It remains a fact , severe AS can be diagnosed with 2D features alone , without the help of Doppler.We also know Doppler is less reliable than 2D in many situations for various reasons .The most important being it’s dependence on angle of doppler intercept and LV contractile force. Outflow tract ventricular tachycardias : Best review articles. A well researched article on a difficult topic. By Kim et all from Cornell university , New york. After reading this article one should be able to answer the following questions. What is Gallavardin VT ? How a non sustained VT becomes a sustained one ? Why some VTs cause syncope ? What is the association between idiopathic VT and Idiopathic VF ? How does exercise trigger a VT ? What do we mean by structurally normal heart ? Readers are encouraged to post link to good articles on this topic. Man made confusions in labelling ventricular tachycardia ! How to name a ventricular tachycardia ? This continues to be a favorite past & present time of modern-day cardiologists. Especially , VTs associated with structurally normal heart suffers with this protracted problem .Widespread use of EP study has not solved the issue as yet. The VTs that arise from the left ventricle in an apparently normal heart has been referred by various terms. Now we have still more exotic VTs like Cuspal , mitral annular , etc . All of the above can mean anything , or same thing in different centers , different cardiologists in different times . VTs associated with CAD , valvular , myocardial diseases generally devoid of nomenclature problems. Ischemic VT is yet to be classified in a proper fashion. The confusion in classifying VT is not due to the complexity of heart disease. It is due to the general comprehension failure as every VT can be described with reference to clinical , ECG morphology, hemodynamics and presence or absence of underlying heart disease. A simplified and clinically useful VT classification is being prepared in this forum .Will be published shortly . 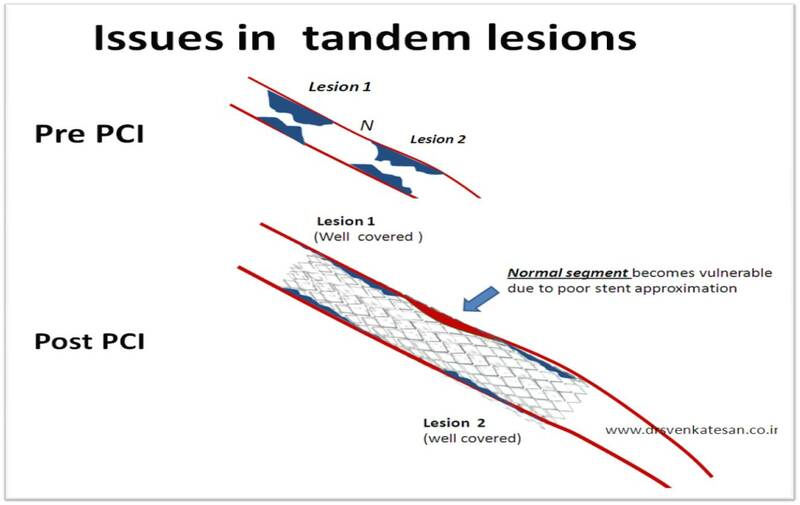 A brief lecture on tandem coronary lesions! Coronary artery lesions can be classified by many types . The popular ones are by Ambrose and Ellis .They are adopted by ACC and SCAI .While various terms are used to describe a lesion. (diffuse, discreet , eccentric , long , tubular etc) A tandem lesion is the one which has special significance , but is not well discussed in the literature . Generally there will be at least few millimeters of normal intervening coronary segment.This is referred to as connecting segment. 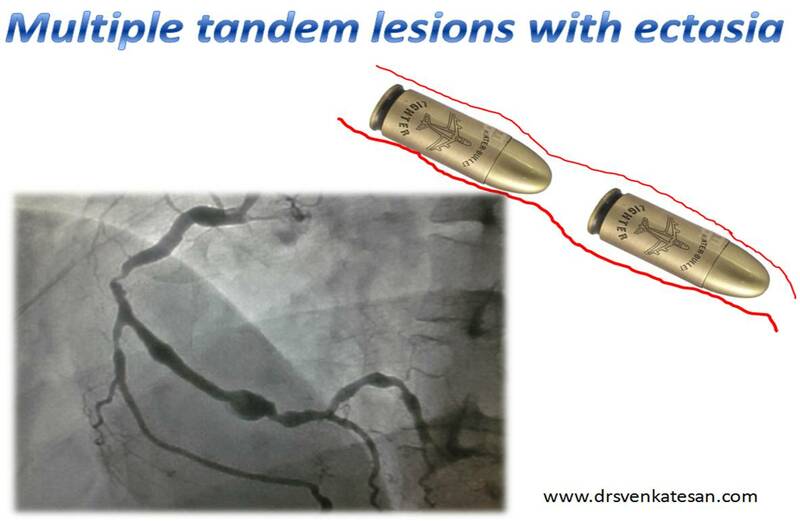 Tandem lesions carry the same significance like any other lesion. But ,the primary aim is to tackle the two lesions with a single stent. We know stent edges are rheological culprits. Two stents have 4 edges. 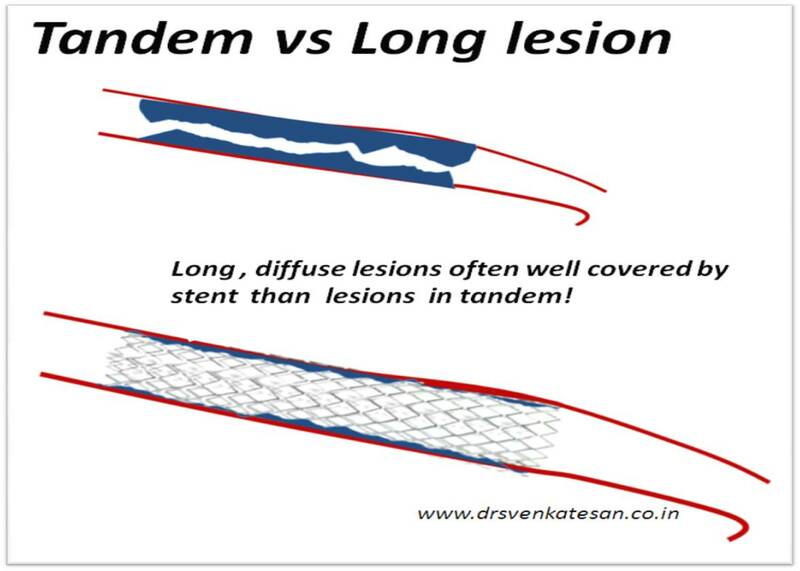 It is better to cover the tandem lesions with one long stent* even if we have a sufficient connecting segment.Geographical miss is less likely with a long stent. In the strict sense one wold require an IVUS (Intra vascular ultra sound ) to confirm the normality of the connecting segment. Tandem lesion is a marker of diffuse atherosclerosis and the connecting segments often show ectatic changes. Many times , spiral folds from a single atherosclerotic lesion mimics a double lesion .This need to be differentiated from true tandem lesion. What is the hemodynamic significance of tandem lesions ? Rules of hemodynamics would dictate , in a linear and laminar flow model across a tube , immediately after an obstruction there will be a significant drop in resistance. Does this rule on hemodynamics apply in tandem lesions ? When a lesion is followed by a lesion with little normal segment in between what happens ? The blood gets a double jolt every time it traverses a tandem lesion. There may not be sufficient time and anatomy for the mandatory pressure drop to occur. So for a given degree of obstruction , tandem lesions is likely to be more thermodynamically significant than a single lesion. Pressure recovery after an obstruction is also incomplete , as the forward head of blood column encounters another hurdle even before it recovers from the initial turbulence. Which lesion is more important in tandem proximal or distal ? The distal lesion determines the thermodynamics of proximal lesion while the distal lesion as such is less influenced by proximal. Some times it may appear , it is better to have a long lesion than a two lesion in tandem. 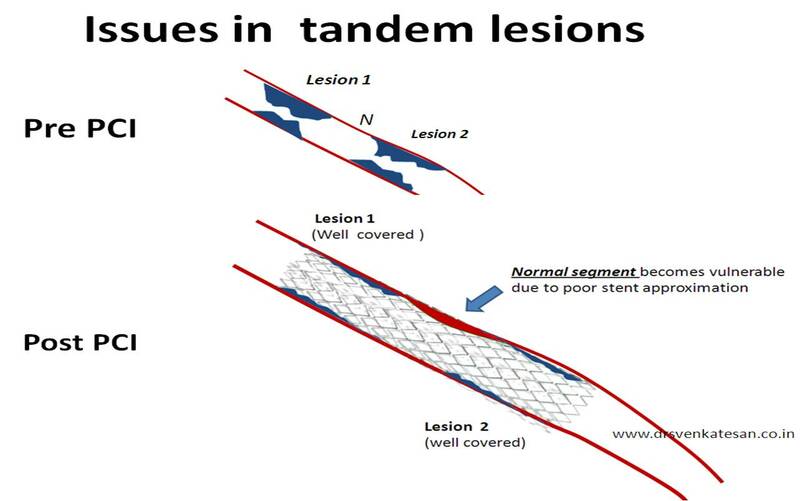 This is because the stent will approximate more evenly .Further there is less likely hood of in -stent restenosis in long lesions as the edge effect can occur right in the middle of the stent in tandem lesions . Now it is increasingly realised, many of the sub acute thrombosis are due to po0r stent approximation in tandem lesions or long lesion. 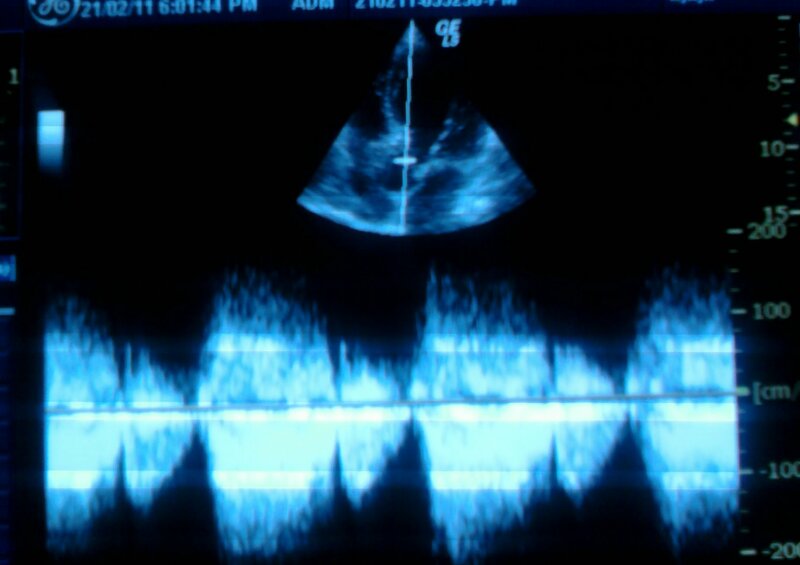 One more cause for dynamic LVOT obstruction : Abnormal Aortic angle ? Inter-ventricular septum is generally in parallel alignment with Anterior aspect of root of aorta. Note the classical bend of basal IVS encroaching the LVOT. Aortic valve opens normally. Pseudo LVOT gradient. It was about 25mmhg which is not significant. Sigmoid shaped IVS can cause a unique LVOT profile . Present in elderly . The exact mechanism and mechanical and hemodynamic implications are not known . It can rarely cause dynamic LVOT obstruction. When these patients develop Infero posterior MI there could be further collapse of IVS into LVOT . Many of the HCM patients may show similar features .When ASH is confined only to basal IVS. HCM should not be diagnosed instead it is often a defect of aorta /IVS alignment . Abnormal aortic angle with that of IVS may make the IVS appear sigmoid. If patients with abnormally angled aorta develop hypertension ASH and sigmoid septum is more pronounced .